Visit our Yorkie dog names page. Yorkshire Terrier dogs are sociable, adaptable and cheerful dogs making them good companions. Yorkies, as they are known, are very affectionate, loyal, highly intelligent and relatively easy to train, although housebreaking them can be a little difficult. These little dogs tend to be quite possessive when it comes to their food and belongings and can get “bossy” around the house if you let them. As the dog’s owner you must become the “leader of the pack” and not allow them to think they are in charge. If you are looking for a small sized watchdog, look no further than a Yorkshire Terrier. They are very alert and can certainly raise an alarm. 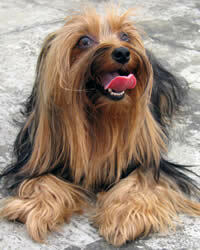 The Yorkshire Terrier breed originated in the Yorkshire area of England. It is said that Yorkies are a cross between different terrier dogs, although the exact details are not known. The breed was a product of the working class and was initially undesirable to the wealthy dog lovers in England. In time, however, Yorkies gained fame and became a fashion accessory for the wealthy. In about 1880 Yorkies came to America and soon became popular. Yorkshire Terriers have a pleasant temperament suitable for those seeking a wonderful companion. They are energetic, inquisitive and quite unaware of their small size. This ignorance of their diminutive state can lead to attempted dominance of other dogs. They may even attack another dog to show their dominance. Though they will not demand much of your time to get exercise, they do need enough space to play and fool around (remember they are full of energy). You should always have them on a leash when going for outside. The males can be very territorial and they do get along very well with other dogs. Yorkies are very good with kids, especially older ones. Living Environment – Yorkshire Terriers do okay in cold weather, but you need to cover him up if you are going to take them for a walk in the cold. They are most happy when playing in the garden or cuddling up to their owners. Grooming – The Yorkie’s coat is silky and lustrous and requires daily grooming. The hair around their bottom must be regularly trimmed to keep it clean and untangled. They are very light shedders. Diet & Exercise – This breed requires minimal exercise. They love to play in the garden, chase their own shadows or play tug of war with their owners. Another thing they love is attention – the more you give it, the more they love you. Health – Yorkshire Terriers can live up to 12-15 years. There are certain dog health problems associated with this breed such as luxating patella, liver problems, cataract, allergies, low blood sugar and dental problems. Their teeth must be regularly cleaned to avoid any dental problems. Since Yorkies are very intelligent, dog training is quite easy. However, you do need to be consistent and firm while training them. Otherwise they will do as they please, making training more difficult. Praise is very important for training, including little treats to encourage them during their training sessions.